Playtex is recalling 1.4 million pacifier holders because of concern that a small child could choke if a part of the clip broke off. The U.S. Consumer Product Safety Commission said Wednesday that the clips – used to connect a pacifier to clothing, diaper bags or strollers – can crack and a small part can break off. Playtex has received 99 reports of the holder cracking or breaking. No injuries have been reported. Playtex is recalling 1.25 million clips in the U.S. and 150,000 in Canada. They were sold from 2010 through October 2013 for about $3 at major retailers including Target, Walmart and online at Amazon.com. 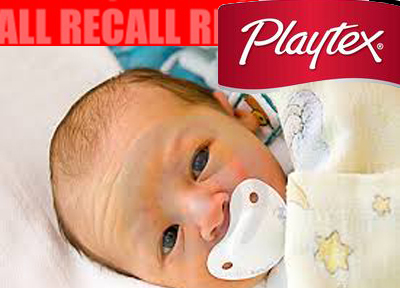 Consumers should stop using the pacifier holder and contact Playtex Products Inc. for a refund at (888) 220-2075 or online at www.playtexproducts.com.